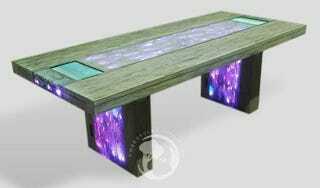 On one hand, the Stardust Table reminds us that furniture can be recycled through the simple integration of new technologies. On the other, it costs about $15,000 and is ugly as sin. You control the 12-person table through two 15-inch touchscreen monitors. Their controls drive an integrated PC, speakers w/amp and, of course, all of those RGB LEDs that cover so much of the table's surface.